Protect both your garden crops and ornamental flowers from rabbits and other animals with these Erva Bunny Barricades. 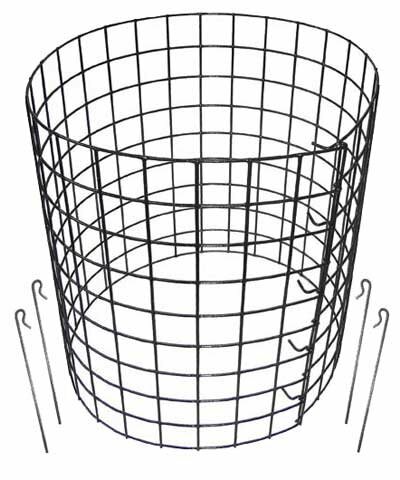 Placing these mesh cylinders around your tulips, roses, beans, or lettuce forms a physical barrier, stopping rabbits from reaching your favorite plants. The sturdy, metal construction and vinyl coating keep each unit protected from the elements, while a hook closure allows each to wrap around a plant up to 12" in diameter. Connect two or more barricades together to fully surround a larger plant. The black color of each keeps them inconspicuous against the greenery of your landscaping, and the four, included metal anchors keep each unit secure in your soil. Keep your favorite crops and flowers safe from rabbits with these Bunny Barricades. Made in the USA. This case pack includes 10 of the Erva Bunny Barricades.